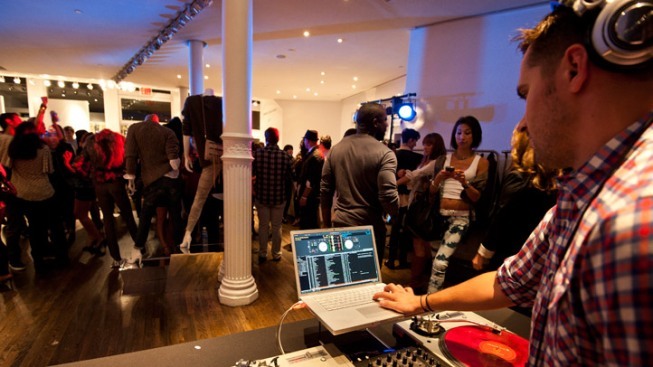 Fashion's Night Out isn't just a New York thing. On the night of Sept. 8, shops in Georgetown and at Union Station will stay open late to offer discounts and incentives that range from prizes to the all-important cocktail. Most of the action will be centered on Georgetown, with an air balloon hovering over the neighborhood to prove it. You'll also find roaming dancers and a fashion flash mob at M St. and Wisconsin Avenue at 7 p.m. Score a free pedicab ride when you show a receipt from any participating Georgetown merchant. Brightest Young Things will host a pop-up lounge at at Dean & DeLuca (3267 M St. N.W. ), with wine tastings, accessory making and an FNO photo-shoot wall. 6-11 p.m.
Purchase a $10 Georgetown eco-friendly tote bag and $15 t-shirt from participating stores, or at the Brightest Young Things Lounge, and 100 percent of the proceeds will benefit Labels for Love. Below, we've highlighted some stand-out stores. You can also check out the complete list of stores and events here. Betsey Johnson -- 3029 M St. N.W. Their own version of Candyland will offer sweets by the National Confectioner's Association and cocktails by Potomac Wine and Spirits. Live models will take a stroll, and you can also enter for a chance to win a Betsey tote. 6-11 p.m. Swing by a cocktail party with light hors d'oeuvres, and witness the introduction of the Theia line and ML Evening by Monique Lhuillier to Carine's. 7-10 p.m.
H&M -- 3222 M St. N.W. Enter for the chance to win a $200 H&M giftcard and an all-expense paid trip to New York City to attend a prelaunch shopping event celebrating Versace for H&M. 6-9 p.m. Score up to 80 percent off spring and summer styles. Madewell -- 1237 Wisconsin Ave. N.W. A pop-up shop will offer merch from vintage shops Pretty People and Treasury. Juicy Couture -- 3034 M St. N.W. The shop is celebrating its Viva la Juicy fragrance and offering incentives on all full-priced items. 6-8 p.m.
Lucky Brand -- 3271-73 M St. N.W. Nosh on moon pies while you shop. Lucky will also be offering special incentives. 6-11 p.m.
TARI -- 1525 Wisconsin Ave. N.W. Fashion blogger Rachel Cothran of Project Beltway will be helping out with personal shopping and style advice. You can also shop vintage pieces from Valentino, Gucci, Chloé and more, reports TheFeast.com.